This afternoon I had a hankering for something sweet. I don’t always make desserts, but today was definitely a dessert day! Unfortunately there was nothing I could shovel straight into my mouth to satisfy my sweet cravings, so I decided to cobble something together. The ingredients that I used were basically ingredients that I had lying around and I am rather happy how well it turned out. This recipe can be adapted to suit whatever you have lying about too! 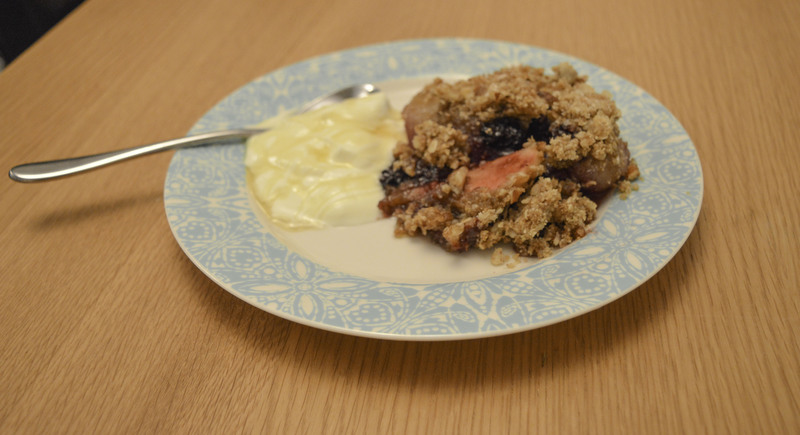 I used normal gala apples, tinned pears and some juicy blackberries that I had stored in the bottom of my freezer – leftovers from our foraging escapades last summer! Other flavours that would taste great are peaches, raspberries and apples, or rhubarb and blackberries! I didn’t pre-cook the fruit as I wanted the filling to have some definition. The cornflour thickens the filling as it bakes – don’t worry you can’t taste it! I sprinkled simple flavourings over the fruit – vanilla and mixed spice. I am obsessed with vanilla powder. You can use it in everything and has a purer taste than extract (which I also love). I literally use vanilla powder in everything – cupcakes, smoothies, puddings…its seriously good. Now I will admit, when it comes to crumbles in the past I have generally used those packets of ready-made stuff. They were super convenient when you needed a pudding in a hurry. But this topping took so little time – I really don’t think I will use the prepackaged stuff again! The pecans and coconut sugar gave the topping a delicious caramel flavour. Whilst the ground almonds provided a natural sweetness. So so good. If you find you have too much topping then bag it up and freeze it. It should keep for about 6 months. 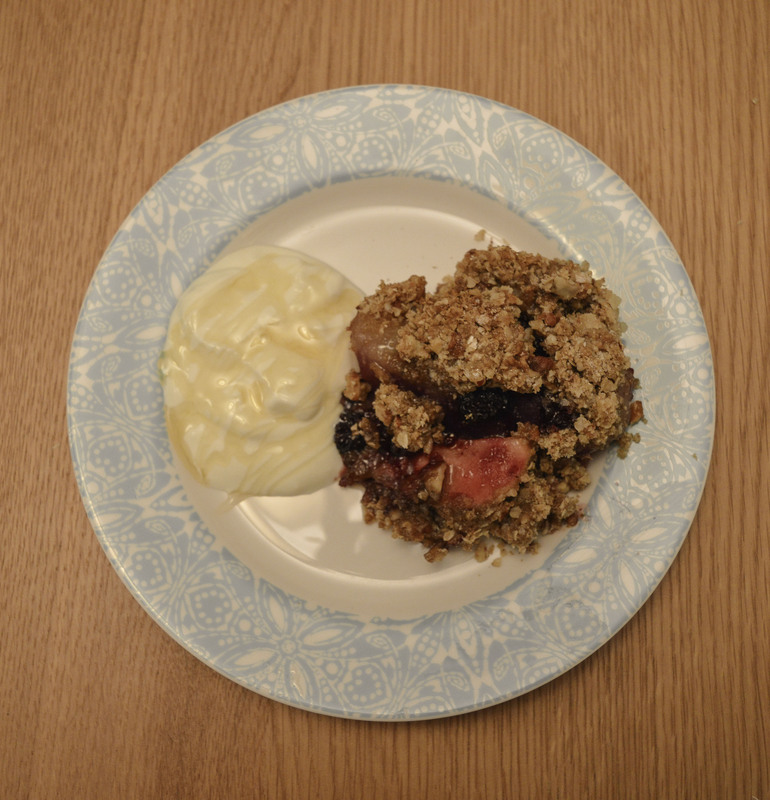 I served my crumble with homemade yogurt drizzled with a bit of honey, but it would also taste great with custard or ice cream! Enjoy! 3 gala apples peeled, cored and sliced. 1 tin of natural pears in juice, drained. 1/4 cup of natural sweetener – like Xylitol, stevia or cane sugar if you prefer. Preheat the oven to gas mark 6. Layer all the fruit in an oven proof dish and scatter over the top the cornflour, sweetener and vanilla powder. In a food processor add the crumble mixture. Pulse until you have a rough mixture and the ingredients are combined. Scatter the topping over the top of the fruit and bake for 30 minutes or until the top of the crumble is brown and crispy. Serve with either yogurt, custard or ice cream! Posted on April 12, 2015 January 7, 2016 by TinaManahaiPosted in RecipeTagged 2015, Apple, April, baking, Crumble, dessert, Oat, Pear, Sunday. Next Next post: PHOTOGRAPHY PROJECT: A WALK BY THE SEA!